The Kizhi state historical and ethnic museum-reserve on Kizhi Island in Karelia. The khorovod, a dance that involves moving in a circle while singing, is a truly Russian art form. Here’s quick guide to the many aspects of this ancient ritual. The word khorovod comes from the old Russian words for “moving around the sun.” This ancient dance was originally a part of a pagan ceremony worshipping Yaril, the mighty sun god. For this reason, the songs and dances were slow, a way of honoring the god and offering repentance. At the same time, the movements were festive, praising Yaril’s greatness. The name khorovod came into use in the 16th century, long after Russia became Christian. According to legend and tradition, Prince Vladimir baptized the Slavic peoples of Rus’ in 988. By this time, the khovorod was already no longer considered a pagan rite, but a form of entertainment for young people and a way for them to meet potential partners. In the explanatory dictionary written by the great 19th century Russian lexicographer Vladimir Dal, the khovorod is described as a gathering of a group of young people with singing and dancing. This beloved folk dance has been known by many names, including: posolon’, karagod, yanok, krug (circle), ulitsa (street). The concept of the dance itself has expanded, and its forms have acquired numerous meanings that have been described in terms of folklore, ethnography, art and conversation. In the broadest sense, khovorod references the peasant concept of the street: to go along a street is to go along khorovod; to not leave someone on the street is to not leave them alone in khorovod. Another broad usage indicates different types of spring and summer activities for young people. Traditionally a khorovod began like this: young women stopped in the middle of the street and started to sing and dance. Gradually, young men would come up to them, usually with musical instruments such as harmonicas, violins, and tambourines, to attract the attention of the young ladies they fancy. On holidays and market days, girls would lead the khorovod round the squares. Often a young man would dance in the middle of the circle with a shawl. At the end of the dance, he would offer this gift to the young lady he liked the most. The khorovod had its own traditions and nuances in different regions of Russia. In the north, it was more restrained and featured a great deal of decorum. In the central regions, khorovod dances were characterized by their sense of fun and light-heartedness; the folk songs that were sung to accompany them were complex. These khorovod dances are marked by clapping, stomping and fast and energetic movements. In the south of Russia, the dances are unrestrained and bold, and performed by many dancers. They often feature wild movements and intricate patterns. The dance must be organized by a khorovodnitsa, who is usually the happiest and liveliest woman in the group. The khorovodnitsa, who is a little bit older than most of the dancers, is in charge of the fun. She stands at the head of the dance, sings and comes up with new dance moves and patterns. 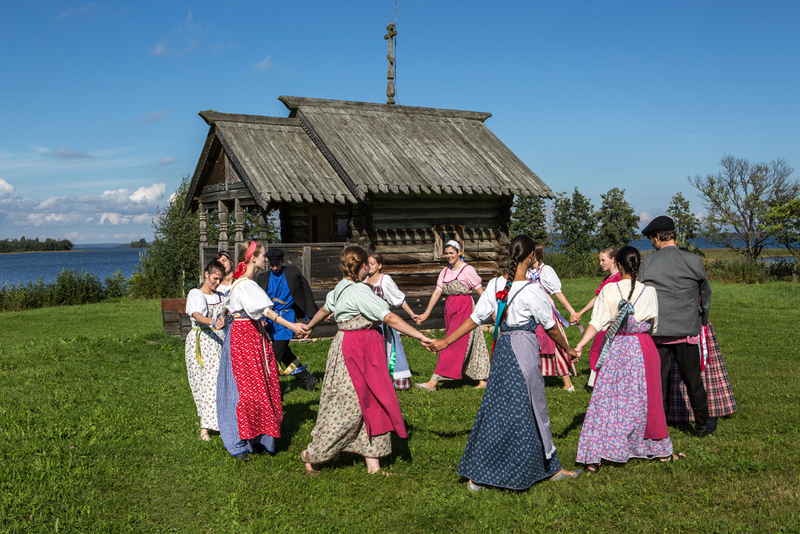 There are two types of khorovod: ornamental and ‘play.’ If the khorovod has no clearly defined format, then the participants move around in a circle and intertwine, making chains of dancers. This is called the ornamental khorovod. Usually the artistry in these dances is associated with motifs of Russian nature. The link between folk art and the life of the people and their songs and dances forms the base of the various dance patterns for this khorovod. Intricate dances where people weave in and out of each other are inspired by Russian lace patterns, wood carvings or paintings. Artisans such as lace makers are also inspired by the khovorod in creating their designs. ‘Play’ khorovod dances must be accompanied by songs. In these dances, there are actors and a plot. The performers portray characters through facial expressions, dances and gestures. Often the characters are animals or birds, and the dancers portray them by imitatating their movements and habits. Over the course of the centuries, one aspect of the khovorod has remained the same — its promotion of unity and friendship. Participants hold each other’s hands, sometimes only by the little finger, and move one behind the other in a strict interval. In this moment, people become one group moving towards a common goal, be it to pray or just to have fun.